(Last Updated : 01.02.19). 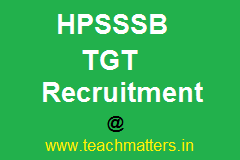 HPSSC/HPSSSB TGT Recruitment 2019 Online Application - Himachal Pradesh Subordinate Services Selection Board (HPSSSB) has extended last date for online application for Trained Graduate Teacher Recruitment 2019. Candidates can apply online from 23.12.2018 to 22.01.2019 (extended up to 08.02.2019) through official website i.e. www.hpsssb.hp.gov.in. The board will conduct written test for TGT Arts (699) & TGT Non-Medical (700) under TGT Screening Test 2019. The Board has advertised these TGT (Arts, Medical, Non Medical) post in HP Elementary Education Department under the Government of Himachal Pradesh. The candidates can check exam result & answer key at the official website i.e. www.hpsssb.hp.gov.in. Check here detailed information as interview letter schedule, exam result, answer key, admit card, exam centre list, vacancy, eligibility criteria, qualification, syllabus, exam pattern etc. HP Staff Selection Commission has invited online application for TGT Recruitment 2019. Here is the latest updates on HP TGT Commission Vacancy 2019 and Himachal Pradesh Teacher Recruitment 2019. B.A./ B. Com. / B.Sc. (NM) / B.Sc. (Medical) With at least 45% marks and 1 year Bachelor in Education (B. Ed.) in accordance with NCTE (Recognition norms and Procedure ) regulations issued from time to time in this regard. Senior Secondary (or its equivalent) with at least 50 % marks and 4 year Bachelor in Elementary Education (B. EI. Ed.) OR Senior Secondary (or its equivalent) with at least 50 % marks and 4 year B.A. / Ed. / B. Com. / Ed. / B.Sc. (NM) / Ed. / B.Sc. (Medical) /.Ed. ii) Pass in Teacher Eligibility Test (TET) duly conducted by Board of School Education Dharmashala. Provided that the incumbents who have already qualified the Teacher Eligibility Test (TET) conducted by HP Subordinate Services Selection Board, Hamirpur shall also be eligible subject to the condition as laid down in Para- 11 of the guidelines issued by the National Council for Teacher Education vide No. 76-4/2010/NCTE/Acad, dated 11.2.2011. Note : There is a relaxation of 5% in eligibility/qualifying marks to SC/ST/OBC & PH candidates. Desirable : Knowledge of customs, manners and dialects of Himachal Pradesh and suitability for appointment in the peculiar conditions prevailing in the Pradesh. Relaxation in Age Limit : Upper age limit is relax able by five years for candidates belonging to Scheduled Caste, Scheduled Tribe and Other Backward Classes, Persons with disabilities & Children/Grand Children of Freedom Fighters of Himachal Pradesh. The upper age relaxation is also available to Ex‐servicemen candidates of H.P. as per provision of relevant rules/instructions of H.P. Govt. Note : Ex‐Servicemen and visually handicapped candidates are exempted from examination fee. However Ex‐Servicemen released on their own request are not entitled for fee exemption. Eligible and interested Candidates can apply online through the website i.e. www.hpsssb.hp.gov.in from 23.12.2018 to 22.01.2019. The printed copy of online application along with necessary original certificates and self-attested photocopies must be brought at the time of personal interview. No other mode of application (offline) will be accepted. HPPSC has declared written exam result of TGT TGT Arts along with rejection lists. TGT Arts screening exam result 2018 is declared on 27.07.2018 for the written test held on 27.05.2018. Check rejection list, screening result & Final Result 2018 at below links. Check here latest updates on TGT Interview Dates 2018. HPPSC will conduct interview after the declaration of the written test result for the post of TGT. Interview dates of TGT Arts written exam result 2018 will be declared by HPSSSB. Check TGT Interview Dates & list at below links. Answer Key of TGT Exam 27.05.2018 & 08.07.2018 can be checked here as official and unofficial answer key. The TGT screening exam was held on 27.05.2018 and 08.07.2018 for the post of TGT Arts, post code 631 and TGT Non Medical & Medical, post codes 632 & 633. The Answer keys are available here as the keys are uploaded on the official website.Provisional answer key of TGT Medical and Non Medical, post code 632 & 633 has been released on 10.07.2018. Check the answer keys at below link. HPSSC issued exam dates for HPSSSB TGT Screening Exam May & July 2018 for the post of TGT Arts, post code 631. The screening / written exam was held on 27.05.2018 and 08.07.2018 as per the given schedule. Admit cards for TGT Exam July 2018 are available as per the schedule at the official website of HPSSC i.e. www.hpsssb.hp.gov.in.